You have gold coins and/or gold bars which you would like to sell? Since we trade with coins and bars, we refund them at a higher rate when purchasing than precious metals that have to be melted down. 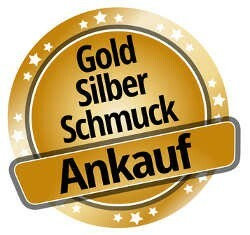 See here how the cash purchase of gold and silver in the form of coins and bars in Freiburg works. If you would like to sell coins and bars of gold and silver online to Edelmetalle direkt, click here. You have silver coins and/or silver bars which you would like to sell? Since we trade with coins and bars, we refund them at a higher rate when purchasing than precious metals that have to be melted down. Condition: the jewellery has to be punched => see here. the amount is paid out immediately in cash (see here the current purchase price). If you allow us to submit the offered goods additionally to an external detailed inspection, our risk will be reduced. For this reason, we can compensate you a 5% more than in the case of the immediate purchase with cash payment. After a succesful authentication, you receive altoghether 80% of the spot price transferred to your bank account. Condition: the jewellery has to be punched (=> see here) and the expected purchase price amounts to 100 EUR at least. 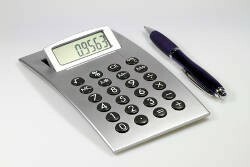 if the offer is accepted by both contract parties, the payment is transferred to the bank account stated by you corresponding to the amount agreed. 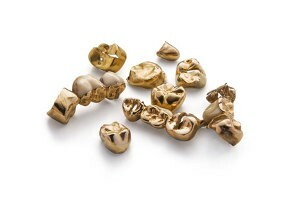 Dental gold consists of an alloy of different metals. In case of high-class alloys, approx. 60% of the weight is pure gold, if you first subtract the teeth and the components obviously not containing precious metals. A fair valuation is only possible with a well detailed analysis. In this sense, we prefer to offer option 2 'purchase with external detailed inspection' for the purchase of dental gold. In former times, numerous coins which were in circulation as money had a high silver content. For instance, old 5 DM coins, old French franc, old Swiss franc (in each case approx. until the end of the 1960s). Furthermore, there are special mintings of these circulation coins which have a high silver content. For instance, 5 DM and 10 DM until 1979, 10 EUR until 2011. On special occasions, special mintings in the form of coins (functional currency in any country of the world) or medals (like coins, but have never been functional currency) with a high silver content have been issued, which were gladly taken by collectors. When purchasing old circulation coins, collectors' coins, medals, and distorted or badly damaged bullion coins of silver and gold, we remunerate the silver content or the gold content corresponding to the current purchase price, the collectors' aspect does not play a role for the valuation. Since these sorts can be inspected for their authenticity quite simply and safely, we abstain from the detailed inspection in a laboratory (option 2) and, however, remunerate the higher sum corresponding to option 2. Therefore, you receive immediately 80% of the spot price, optionally in cash or by bank transfer! If a silver-containing coin still is a functional currency in Germany nowadays, we remunerate at least the official exchange rate of the German Central Bank. 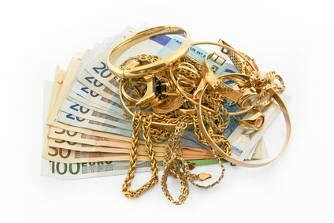 While coins and bars can be checked immediately for authenticity and their precious metal content by us (see authentication), the possibilities for checking gold jewellery and silver jewellery immediately with regard to their authenticity and their fineness are unfortunately limited. In the tables below, you see the current purchase prices for gold jewellery, old gold, and medals or silver jewellery, old silver, and silver medals.